In celebration of its 25th year anniversary, Chateau 1771 is offering two special treats from May 18 to 31, featuring well-loved and one-of-a kind dishes by the group’s Executive Chef, Vicky Rose Pacheco. True to the spirit of festivity, Chateau 1771 offers two stand-out dishes that have stood the test of time with a glass of wine for P990 net, available during dinner only. The first course is the restaurant's renowned Raclette, a luxurious melted Swiss cheese with marbled potatoes, pickled onions and gherkins-- a certified favorite for over two decades. The piece de resistance is the restaurant’s head-turner, Potence (pictured above). 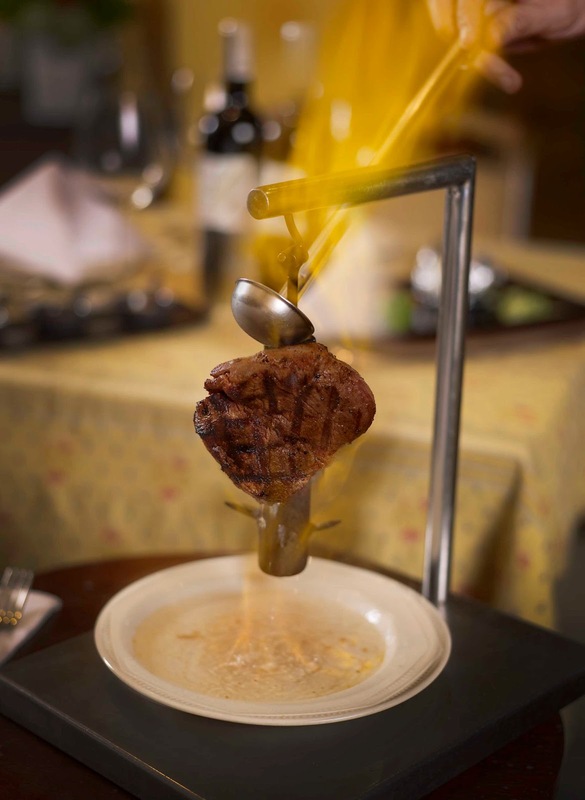 Juicy and flavorful steak hangs from a metal gallows is presented to the diner flambéed with skill and flair. The beef is seasoned, robust and tender, dressed in its natural juices then whisked with some brandy. The second menu is a tribute to Chef Vicky’s academic roots: a degustation menu highlighting Chateau’s signature dishes, especially prepared for Hotel and Restaurant Management students and 2013 HRIM graduates. Get the royal treatment and indulge in a sumptuous degustation for every group of four at P550 net each from 2 PM to 5 PM. Designed to delight and inspire future chefs and restaurateurs, the menu includes French Onion Soup, Caesar Salad, Pasta Chorizo, Lemon Chicken, Potence, and Coffee Pie. Upon reservation, valid school ID’s or class cards should be emailed to Alina Armena at chateaurestaurants@gmail.com.